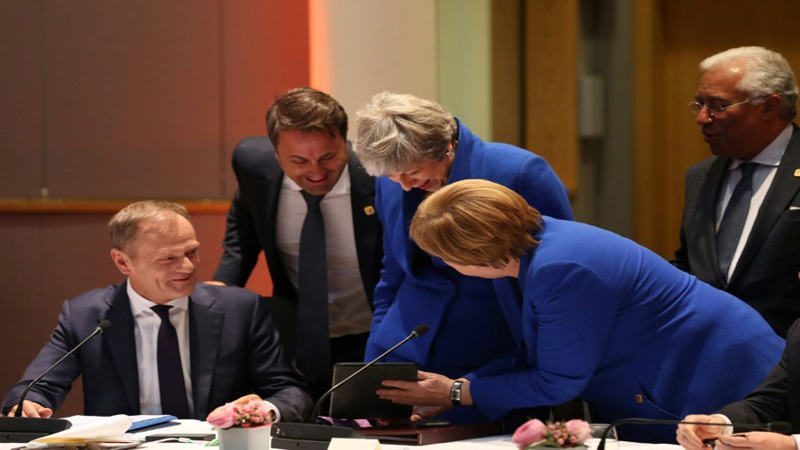 The other 27 EU leaders met without May over dinner to thrash out what European Council president Donald Tusk called "a flexible extension until 31 October", before she returned to seal the deal.Tusk had proposed a year-long delay, but said: "It's still enough to find the best possible solution. Please do not waste this time." The summit was more tense than expected, with France's President Emmanuel Macron the strongest voice opposing a long extension as the talks stretched from early evening to early Thursday morning.With backing from Belgium, Austria and some smaller EU states, he pushed to limit the delay to only few weeks and demanded guarantees that London would not interfere in EU business during that time. "The October 31 deadline protects us" because it is "a key date, before the installation of a new European Commission", he said.May left the group after giving what one official said was a "solid" presentation of her case, but was kept up to date by Tusk, who met her before, during and after the discussions. The summit conclusions make clear Britain was a full member of the EU until it left, but noted the "commitment by the United Kingdom to act in a constructive and responsible manner throughout the extension".AFP.